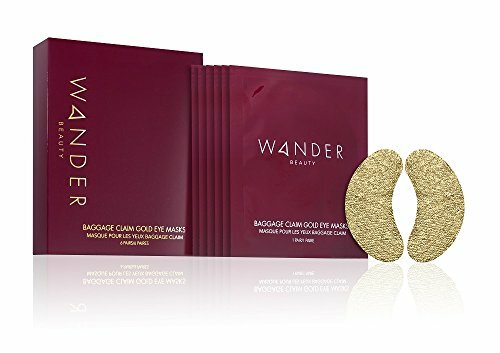 Wander Beauty Baggage Claim Gold Eye Masks by Wander Beauty at Elastic Heart. MPN: 10210-001. Hurry! Limited time offer. Offer valid only while supplies last. WHAT IT IS A gold foil eye mask that is individually packaged to hydrate, brighten, and reduce the appearance of fine lines and dark circles. WHAT IT IS A gold foil eye mask that is individually packaged to hydrate, brighten, and reduce the appearance of fine lines and dark circles. BENEFITS FOR YOU Moisturizing. Calendula, Shea Butter, and hyaluronic acid soothe while moisturizing the delicate skin under the eye. Brightening. Camu camu extract evens the skin tone under the eye for a brighter appearance. Soothing. Aloe leaf extract and lavender oil cool and hydrate the skin. Diminishes puffiness. The cooling sensation calms the skin and reduces puffiness. Innovative. The gold foil keeps ingredients from evaporating, giving you the most benefits. YOU'LL EXPERIENCE These eye masks comfort and soothe the under eye area with lavender and aloe leaf for a cooling, refreshing sensation that diminishes fine lines and puffiness. WHY IT'S GLOWING Gold is a girl's best friend. In particular, these gold eye masks. When your eyes need a little rejuvenation, these eye masks come in quite handy and deliver immediate results. The combination of skin-loving ingredients calms and soothe puffy, red, dehydrated skin under the eye. The result? Ultra-refreshed eyes in as little as 10-15 minutes. STUDIES SHOW In a consumer study: 100% say undereye feels more soothed and hydrated than before application 96.9% said undereye is less puffy and looks brighter 93.8% said dark circles are less noticeable 90.6% said undereye area is plumper WHAT'S NOT IN IT Formulated without parabens, phthalates, or gluten. If you have any questions about this product by Wander Beauty, contact us by completing and submitting the form below. If you are looking for a specif part number, please include it with your message.